According to various Pakistani Media reports from 100 to 150 Pakistan Army Soldiers where buried in a Snow Avalanche in Siachen Glacier On Saturday morning near Indian occupied Kashmir border. 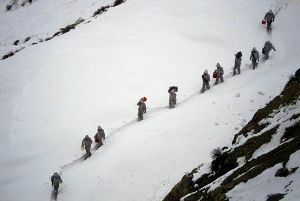 The incident taken place because a avalanche hit a camp of Pakistan army near Siachen Glacier. According to Pakistan Army Spokesman Major General Athar Abbas the rescue operation has been started with help of Helicopters. Many bodies are also recovered from the spot. Pakistani and Indian troops are present on Siachen from 1984 and most of soldiers of both sides have died due to weather instead of war there. Siachen Glacier is located in Himalaya Mountains and due to massive cold weather many Soldiers from both sides loses their lives each year.